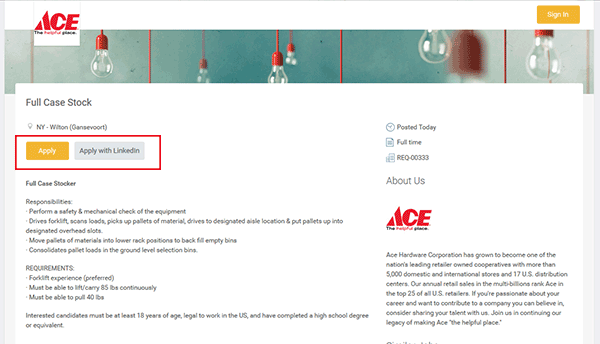 Use the links on this page to download the Ace Hardware job application or go to the company’s online application portal. The guides in the sections below detail the online/offline hiring processes. It should be noted that only corporate and distribution center positions can be applied for online. If you want to get hired for an in-store position you should download the application and submit it in-person at a location in your area. 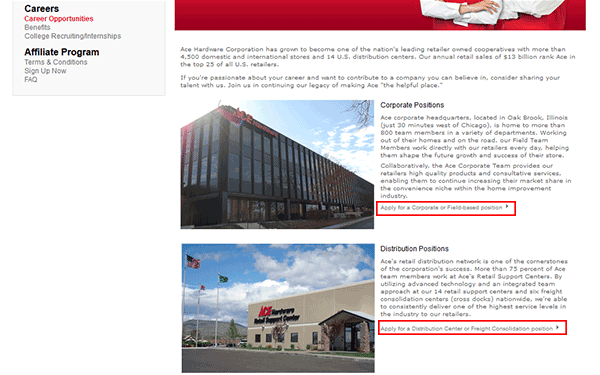 About the Company: Ace Hardware is an American retail hardware cooperative based out of Oak Brook, Illinois. The company is the largest cooperative of retailers in the United States (that is not a grocery cooperative). There are more than 4,500 locations throughout the country as well as abroad. Step 1 – Click here to go to the career opportunities page. Step 2 – Scroll down the page and then click one of the “Apply” links (e.g. corporate, distribution, or freight consolidation). 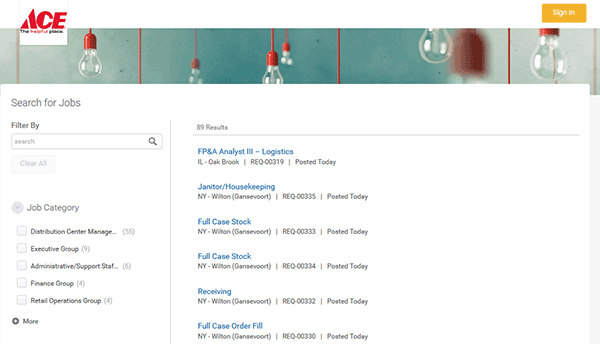 Step 3 – On the main search page the results can be filtered by category, location type, location, or job type. Step 4 – Press the link of the position that interests you. Step 5 – Click one of the links as outlined in the screenshot to go to the next step. 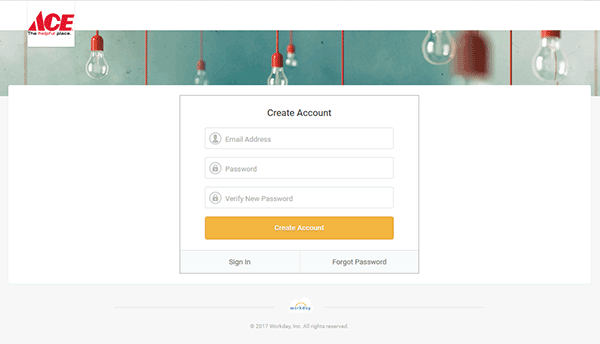 Step 6 – Press the “Create Account” link if you need to register a new account. 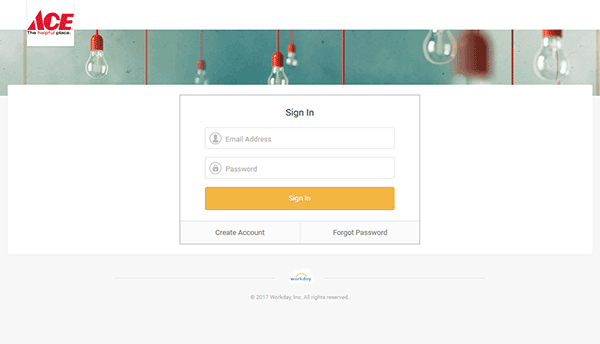 Step 7 – Fill in your email address and then enter a unique password. Click the “Create Account” button to finish the registration process. 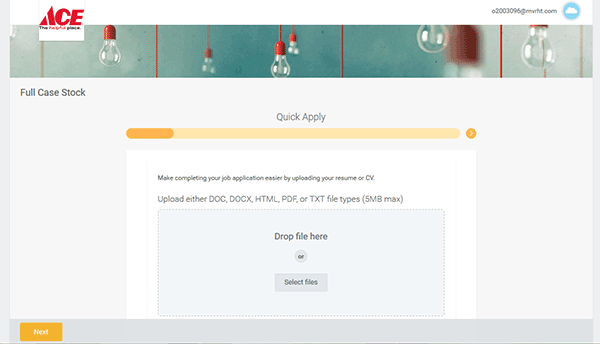 Step 8 – Upload your resume/cv (not required). Step 10 – Submit the required information for each of the remaining subsections. After all of the required information has been provided you will be able to submit your application for processing. Step 1 – Download the application form by clicking the button at the very top of this page. 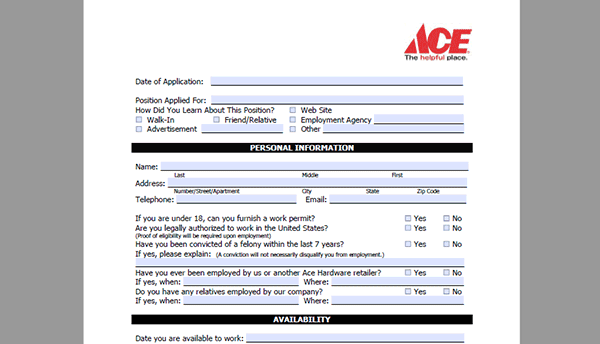 Step 4 – On the third page complete the “Supplemental Information” section and then sign/date the form.